Renewable energy source popularity is on the rise lately. Just for a small investment upfront, you can save a lot of electricity fee in the long run. And to people that enjoy traveling in the RV, this means they will be less dependant on shore power and alike. So do you want to cut down your RV operating cost as well? If you do then this article will show you some of the best RV solar panels you can find on the market. Check them out and see if anything that catches your eyes. Generally, the solar panels may vary a lot from one to another. From the panel material to its size, not everything is the same. The difference can be partially explained by their price tags. A functional solar energy system consists of solar panels, control box, inverter, cables, wires and batteries. So besides the panel, you will eventually need to purchase additional components. How the entire system operates is pretty simple, actually. When sunlight touches the panels, the solar panels will start generating electricity and transmit it to the control box to the batteries. These batteries then run the electricity straight to the converter. The DC power from the batteries will be converted to AC power here for the RV electric appliances usage. That should cover the basic information that you should know about solar energy principle. Next, it’s time to talk about solar panel specifications. These numbers are very important if you want to successfully equip your RV with solar power. For the most part, you shall need to inspect the panel size, its material, power and weight. Each RV in each condition may make one type of panel the better choice than the rest. Therefore, pay attention and think carefully before you come to the final decision. This is another quality solar panel you can find around. A minor downside is that it uses a less efficient panel material. To overcome this disadvantage, the panel size is quite large. Hence, it’s maybe difficult to install on a small size RV. Instructions are easy to follow and installation is simple. You will also find it in a more affordable price tag too. 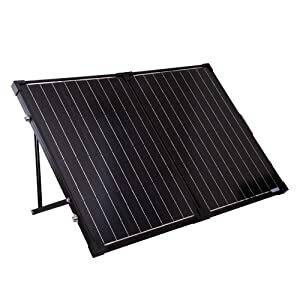 This one is among the best and popular solar panel on the market. It got this reputation due to high-quality material and excelled output. 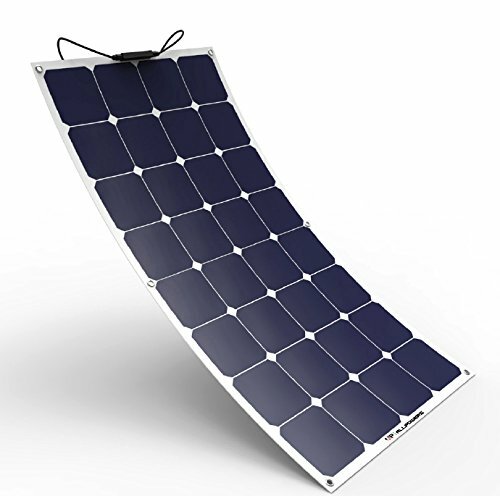 Made from Mono-crystalline, the panel has employed the most effective solar technology available. The energy conversion rate is powerful and fast. 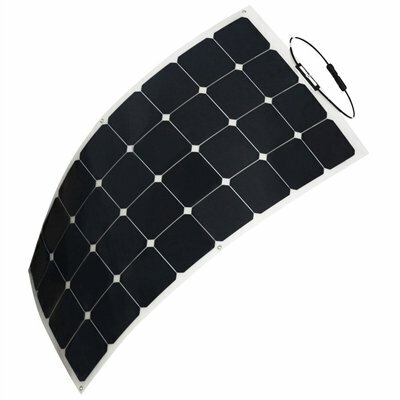 At only 4 lbs, the panels are very light and portable. It also makes it easy for transportation purpose. While classic solar panels use aluminum to encase the cell, HQST uses thin plastic sheets. Aluminum increases the panel durability but makes it heavy and hard to transport. So to avoid end up with too much weight, HQST laminated it Mono – crystalline cell into the plastic panel. The result is a light, flexible product that you can conveniently carry and install. Even with the plastic, the panels still remain strongly built. 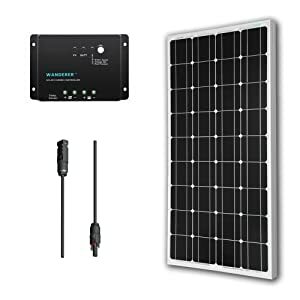 A product with priority on mobility, this innovative solar panel can provide your RV with electric wherever you go. The panel is built with a portable mindset and off – the – grid occasions. The solar panel will constantly charge your batteries and keep your appliances operational at the same time. It’s also an all – in – one system. You want a portable solar charger. This is the best you can get. ALLPOWERS is a well-known corporation in the solar energy. So you can expect that this product from them will employ efficient designs and top – of – the – line materials. With a 100W output at 12V, this is a lot of power considering the panel lightweight. It is claimed that the panel efficiency can reach between 22 – 25%. This is a very high conversion rate, it may even stay among top solar panels in this aspect. The use of Mono – crystalline cell can be said to be a large factor in the product success. Utilizing plastic sheet and durable laminate, the panels is both tough and flexible. You will have little trouble installing it on uneven surfaces. Since there isn’t any glass in or around it, shattering is no longer a concern. There is also mounting hole so you can secure with anything you like from rope to screw and bolt. The delivering service needs some improvements. There are complaints about damaged products by customers when they receive it. If you feel that flexibility, light weight and durability can’t get along, this panel will prove otherwise. GP-FLEX-100 can be bent up to a 30-degree angle and still intact. It’s also extremely tough that even if you drive a car over the panel, there’s hardly any damage. The panel is just that tough and still remains very light. With the offer of a large saving in electricity cost in off – the grid trip, it appealing is undisputable. If you want something basic and efficient, this product is for you. 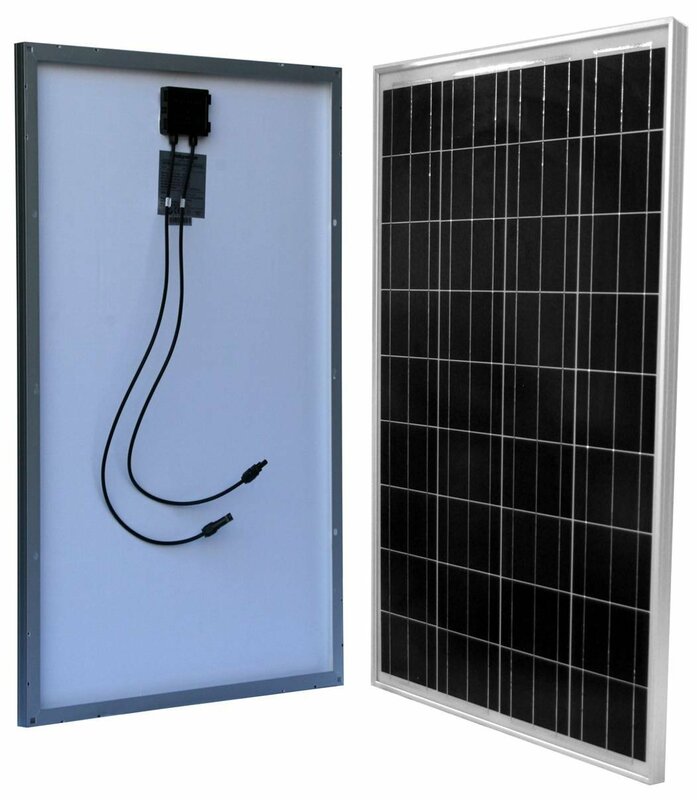 The Renogy solar panel kit offers a considerably faster charging rate compared to any other. With components in the kit, you can expand your current solar system or a start a new one, depend on your taste. It versatility hence fit in well with an RV. 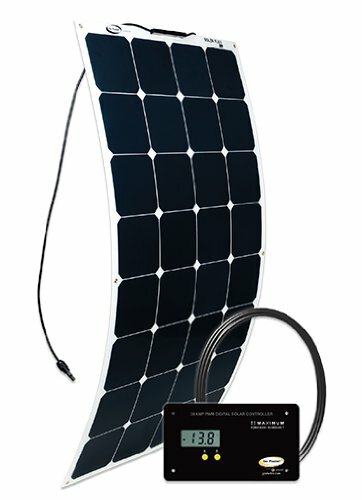 This kit includes solar panels, adaptor bundle and control box. Since the control box is designed to be close to the control box in the setup, you no longer need an extension cable. The high energy conversion feature of the Mono – crystalline panel will significantly shorten the recharge time. In normal condition, it can fully charge the usual 12V battery in less than a day worth of sunlight. The kit is also well – protected from the weather and very durable. So it’s another big plus for outdoor environment such as a traveling in an RV. And those are among the most popular solar panels you can get in 2017, see anything you like? With solar energy, you don’t have to frantically search for shore power every time you part over in your RV. Now, you will have more freedom planning your trip across the land. And you can achieve that simply by examining the product above and purchase what you feel to be the best RV solar panel for your vehicle. can also be a problem. your whole house, as it may not be possible on solar panels alone.